Symphony House – AlfredHouse Assisted Living, Inc.
We are excited to announce the opening of our 10th AlfredHouse boutique assisted living facility! 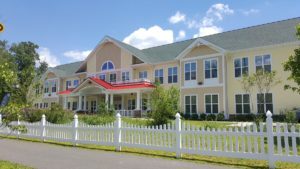 Symphony House, a thirty-four bed residence, is a new and innovative assisted living home offering integrated care for the elderly with mental health and aging cognitive challenges. Symphony specializes in Behavioral Health, with 22 beds devoted to treating people with mental health diagnoses as well as dementia-related cognitive challenges. In addition to AlfredHouse’s standard 1:4 caregiver ratio and exceptional personal care, we are excited to offer several natural remedies for physical and mental health challenges: Contrast Foot Baths (a form of hydrotherapy), aromatherapy, massage therapy, music therapy, and our state-of-the-art Snoezelen Room. Symphony House boasts many outdoor and indoor seating areas employing bright, soothing colors and natural light. Please contact us to learn more or to schedule a tour of the Symphony House.